Marin offers an abundance of tours and tastings, for tourists and locals alike. A place’s touristic appeal may not come to mind very often for locals. When you go about your business, visit favorite restaurants and bird-watch from your favorite vistas, it’s easy to forget that some people travel very far to do the very same thing. In Marin County especially, where everyday living is inevitably soaked in nature and organic products, we often take for granted the attractiveness of the region. And yet, the abundance of tours, travel packages and wine-tasting programs is a great reminder: Marin is a California culinary destination. Just enter an experience-awarding website like Tripadvisor-owned Viator.com or LivingSocial, and Marin County foodie tours are a hot commodity; Tomales Bay. Hog Island Oyster Company. Table Top Farm in Point Reyes. Cowgirl Creamery. All of Marin’s highlights are there, accompanied by images that make the region look utterly irresistible and somewhat other-worldly. Renée ReBell, the founder of Gourmet Food & Wine Tours, knows this well. “I started Gourmet Food & Wine Tours two-and-a-half years ago on the Sonoma Plaza, after taking my first food tour in Chicago the year prior,” she recalls. She was already in the wine industry, working with small-production winemakers and promoting their creations with food created by local chefs for specialty events. Within two years, she began running Sausalito- and Tiburon-bound foodie trips, combining her love for hospitality and local offerings. “All of the destinations are places I would visit when I wanted to have a special dining experience in my 23 years of living in Marin County,” she says. The tours ReBell specializes in are equal parts wine and food, “except the ambiance comes from top restaurants instead of a winery.” ReBell makes sure to include well-known local ‘stars’ such as Larry Mendel’s Poggio in Sausalito and nostalgic, must-go-to stops like Sam’s in Tiburon. “Besides being a walking tour, we offer interesting historical tidbits along the way that are relevant to the landscapes we walk through,” she says. 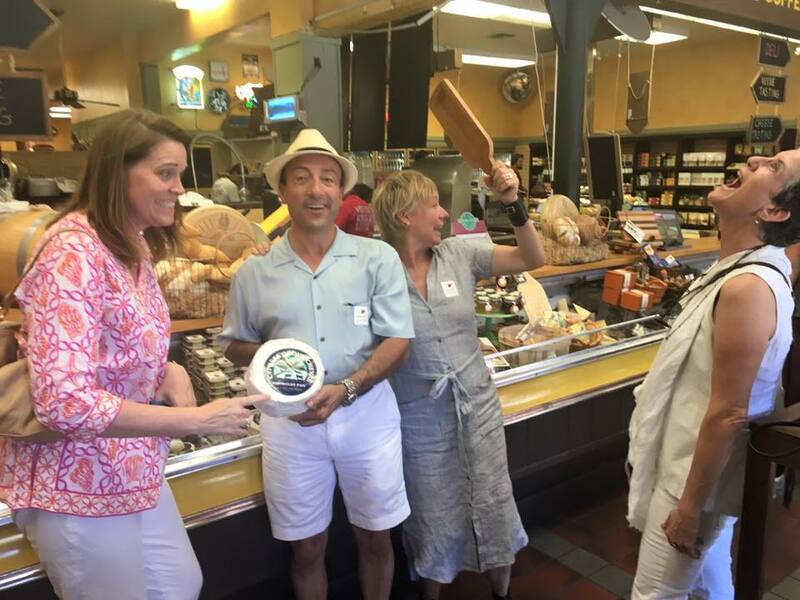 Gourmet Food & Wine Tours hits the popular spots in Tiburon and Sausalito. Photo courtesy of Gourmet Food & Wine Tours. 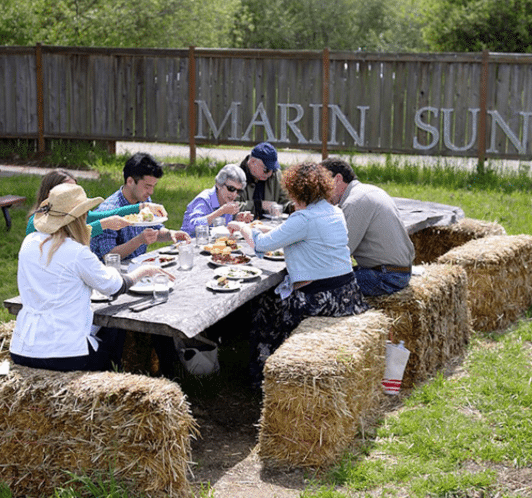 West Marin Food & Farm Tours combines van adventures, delicious food and a history of the region. Photo courtesy of West Marin Food & Farm Tours. And over at Cozymeal, a Bay Area startup platform for cooking classes and foodie experiences, the Marin County section is abundant with options, from Paella-making in San Rafael to a vegan salads tutorial. Marin’s healthy and ultra-Californian appeal makes a guest appearance in the advertising: “The sunny part of the Bay is the birthplace of Californian cuisine and home to the freshest ingredients around,” claims the website. “Cozymeal chefs offer crisp vegetables, hot baked goods, and homemade pasta that will tickle your tongue like the sun during a nap outside. Our classes will brighten up your cooking as you take in a sweeping view of the foothills.” Sounds quite dreamy, even to a local ear.